Hi Stampers. I was recently asked to make a rustic wedding card. For those of you that know me, I’m not the rustic type. LOL With some brainstorming and a little bit of inspiration from Pinterest – I came up with this card. This card starts with an Early Espresso card base 8.5″ x 5.5″, scored at 4.25″. Next up is a layer of Garden Green card stock 5.25″ x 4″. Over that I adhered a 5″ x 3.75″ piece of Wood Textures Designer Series Paper. I stamped the greeting from the Better Together Stampin’ Up! stamp set in Early Espresso ink onto a scrap piece of Whisper White card stock and trimmed it to the height of the stamped greeting and flagged the end of the strip with the Triple Banner Punch and attached it with stampin’ dimensionals. I saw the wedding couple hearts on Pinterest and thought they would look adorable against the wood texture DSP. I used the retired heart punch, but you could easily use the sweet & sassy (heart) framelit dies. The bride was cut from Dazzling Diamonds glimmer paper and basic pearl jewels. The groom was cut from Whisper White and Basic Black card stock. I cut a small V out of the Basic Black heart and glued it to the white heart. I then cut the bow tie from the cookie cutter punch in Basic Black card stock. I sponged just a touch of white ink on the edges to make the bow pop a little and attached it with mini stampin’ dimensionals. I then punched some small flowers out with the itty bitty accents flower punch. I adhered them with a mini glue dot and placed a basic pearl jewel in the center. For the interior of the card I used a 5.25″ x 4″ layer of Whisper White card stock and glued a small strip of the Wood Textures DSP that was leftover from the front onto the left side. I stamped the sentiment in Early Espresso ink. To finish it off I punched a few more flowers with the itty bitty accent punches. I noticed they didnt stand out enough, so I sponged a little Daffodil Delight ink onto the edges. They were adhered them with a mini glue dot and placed a basic pearl jewel in the center. 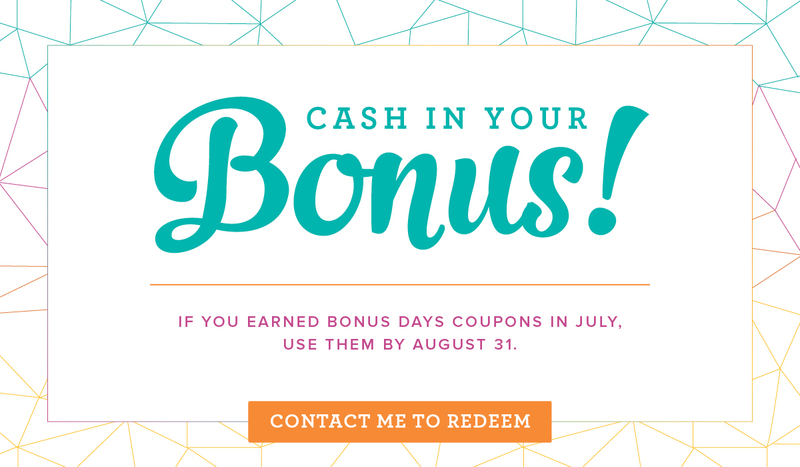 Tomorrow, Thursday, August 31st (2017) is the last day to use those bonus days coupons! Make sure you have used yours! If you need any help, feel free to contact me. We wouldn’t want you to miss out on FREE MONEY! By now, you should have your hands on a copy of our awesome 2017 Stampin’ Up! 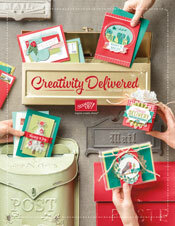 Holiday Catalog!! You can start placing your orders for product from this awesome catalog on Friday, September 1st (2017). Come back on Friday for another blog post and a link to see this catalog digitally online. Hi Stampers. Summer is officially here! 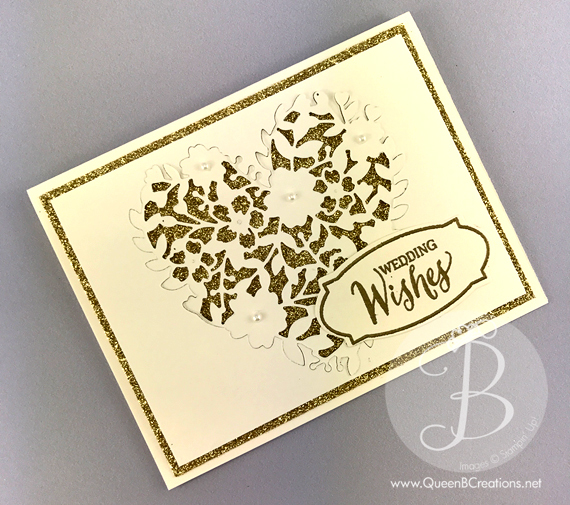 That means wedding season is in full bloom and what better way to celebrate love than with Stampin’ Up!s beautiful Bloomin’ Heart Thinlit Die over Blushing Bride glimmer paper. 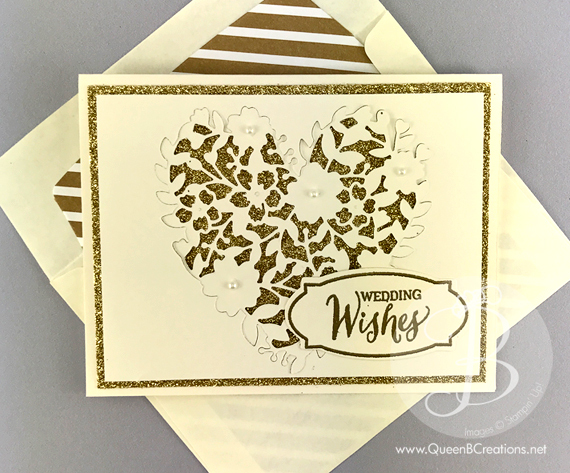 This beautiful card starts out with a Whisper White card base 8.5″ x 5.5″, scored at 4.25″. Next up is a 5.25″ x 4″ layer of Blushing Bride glimmer paper. The top layer is a 5″ x 3.75″ piece of Whisper White card stock that I used to cut out the Stampin’ Up! Bloomin’ Heart Thinlit Die. I cut the die in the center of this layer on my Big Shot using the precision base plate (which is awesome for the more detailed dies and gets a cleaner cut). 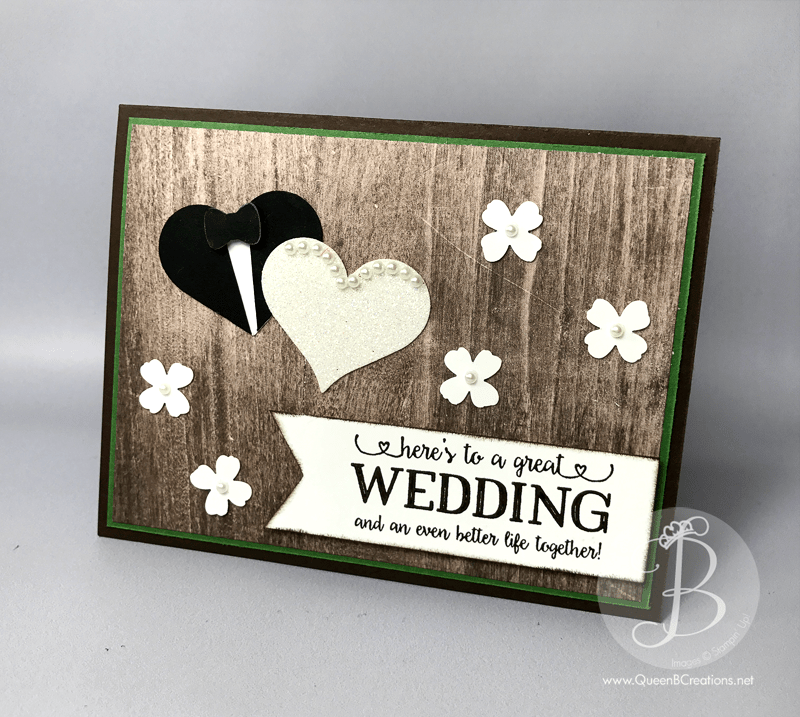 I used my Big Shot die brush to clean out all the little pieces by leaving the card stock in the die and placing it on the foam mat and rubbing it with the die brush until all the little pieces fell out. 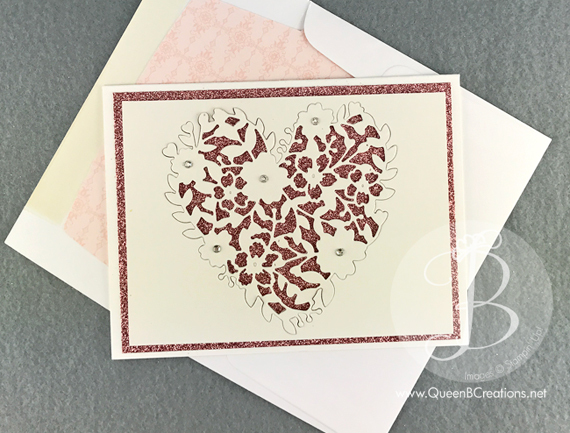 I then adhered that layer with the heart missing from it onto the glimmer paper with stampin’ dimensionals and then insert the heart into the center where it was cut out using stampin’ dimensionals under each of the larger flowers. Note: Did you happen to notice that we now sell MINI stampin’ dimensionals?!?! How cool is that! Perfect for projects just like this! I’ve included the link to buy them from my store below in the supply list. I used the coordinating Bloomin’ Love stamp set to stamp the small flowers with Blushing Bride ink in the upper left and lower right corner. This left plenty of room for the sender to write a personal note, but made it match the front of the card. 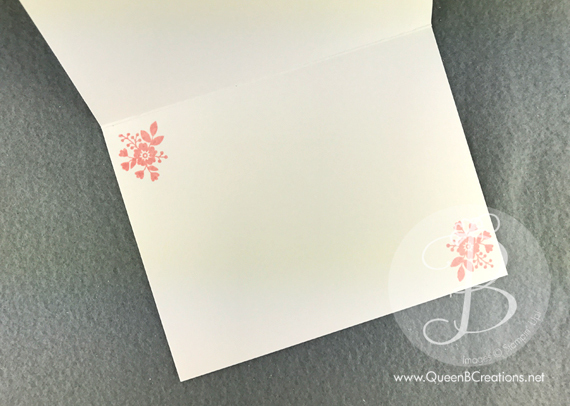 I then lined the inside of a medium Whisper White envelope with some retired Designer Series Paper and added a few rhinestone jewels in the center of the larger flowers. It’s now ready to give a smile to someones face. Hi Stampers. If you were on my blog a few days ago you saw the wedding card that I made with the Bloomin’ Heart thinlit die. I chose to make a 5oth wedding anniversary with some of the same supplies. For this card I added the Number of Years stamps set and the Large Numbers Framelit dies. 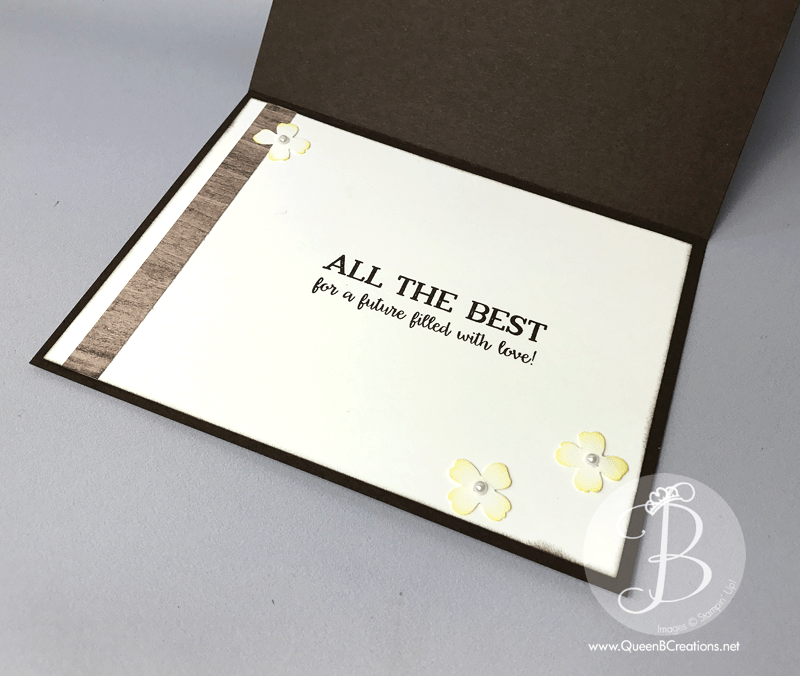 This card starts with a Very Vanilla card base (8.5″ x 5.5″, scored at 4.25″). Next up is a 5.25″ x 4″ layer of gold glimmer paper – followed by the 5″ x 3.75″ layer of Very Vanilla card stock that has been run through the Big Shot with the Bloomin’ Heart thinlit die. For the focal point, I cut the 50 out of gold foil paper and attached the numbers with mini glue dots. 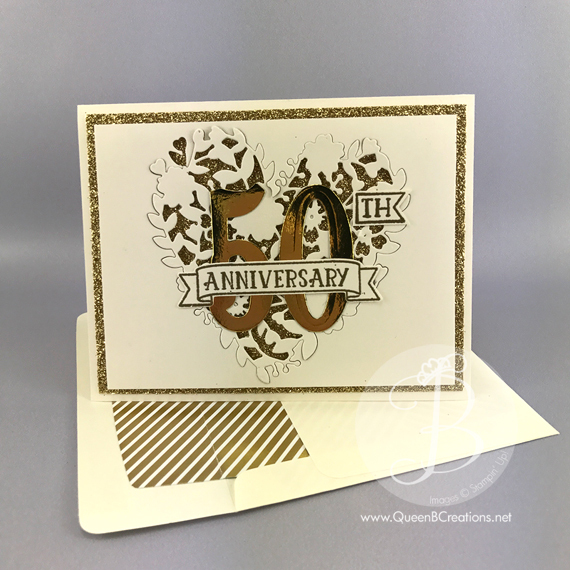 I then stamped the “anniversary” with frame and the “th” with frame onto scraps of Very Vanilla card stock with Versamark ink and used Gold stampin’ emboss powder and the heat tool to heat emboss these and then cut them out with the co-0rdinating framelits. These, too, were attached to the card front with mini glue dots. 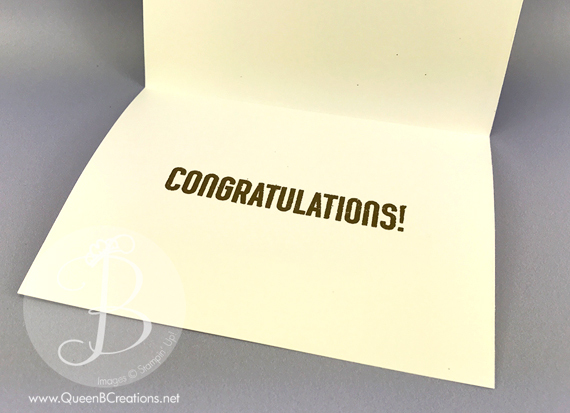 On the interior of the card I heat embossed the phrase “congratulations” (from the retired stamp set, Bravo) in gold. Anyone who has made it 50 years in a marriage deserves a great deal of congratulations! My grandparents made it to their 5oth and beyond, while my parents enjoyed 40 years of marriage before my dad passed. I’m very proud to say that my husband and I are on year 27 and going strong. I hope that you are surrounded by happily married couples and can put my idea to use. I’ve included my list of supplies with links to my store below. Remember to use this months hostess code (AFX66EX6) for your chance to win the hostess credit for May. Hi Stampers. I was recently asked if I had any wedding cards for sale. I’m embarrassed to say I did not. So, that gave me the chance to go play around int he office and come up with a few. This is one of the ones I created using the Bloomin’ Heart thinlit die. 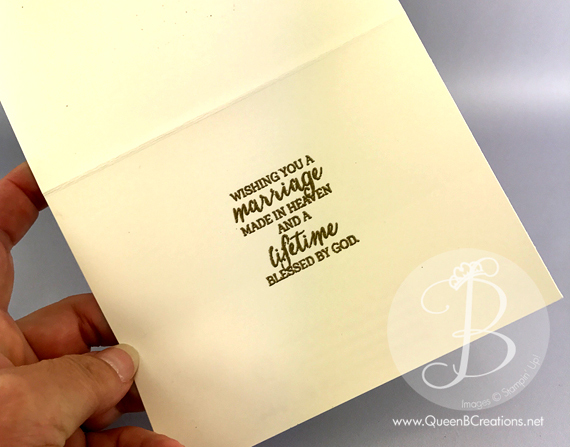 This card starts out with a Very Vanilla card base, 8.5″ x 5.5″, scored at 4.25″. (Exciting news – the new catalog will over a thicker (80lb) version of the Very Vanilla card stock that will be perfect for card bases!) Next up is a 5.25″ x 4″ layer of Gold glimmer paper. I used a 5″ x 3.75″ layer of Very Vanilla card stock to cut out the heart on the Big Shot using the Bloomin’ Heart thinlit die. After cutting it out, I removed the little pieces from the cutouts and inserted it back into the layer and attached that layer, with the heart, onto the Gold glimmer paper with the mini glue dots. For the sentiment, I used the Wedding Wishes phrase and the frame around it from the Rose Wonder stamp set. I inked it with versamark ink and used gold stampin’ emboss powder and heated it up with the heat tool. I then cut it out using the c0-ordinating framelit from the Rose Garden framelit dies. I attached that to the card front using the stampin’ dimensionals. I also added a few pearl basic jewels to add richness to the card. On the inside of the card I embossed the sentiment (using another stamp from the Rose Wonder stamp set) using versamark ink and the gold stampin’ emboss powder and the heat tool. 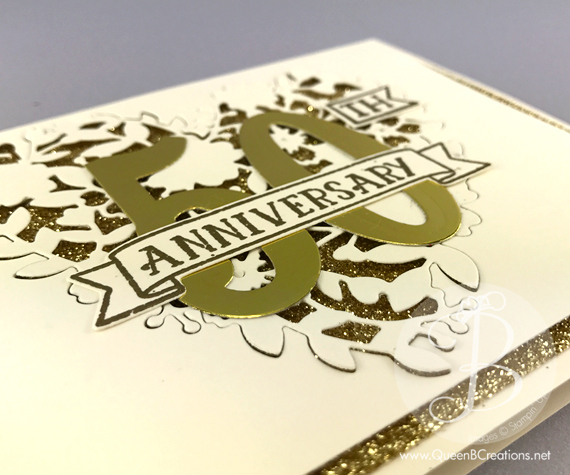 I feel the gold embossing gives the card a much more elegant feel. If you would like to make a card like this one, I have included a list of supplies used below. The list links directly to my online store where you can purchase these items 24/7. Each purchase you make in my store earns you royalty points that can be used for free product when you accumulate enough points – how fun is that?!? You also want to remember to use the mystery hostess code for your chance at being this months mystery hostess!